Mr. Ikechukwu Anyanwu the Founder of Arise Afrika, GCFN & Sommies speaks on the need for media to unite. 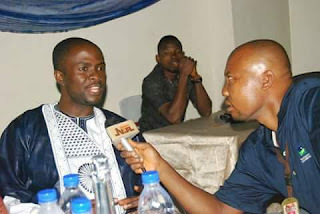 Mr. Anyanwu who is the Publisher Arise Africa Magazine, National Chairman South East: National Liberation Association, Member Imo State Bloggers Association, said their is need for media to unite for undisputed and credible elections. 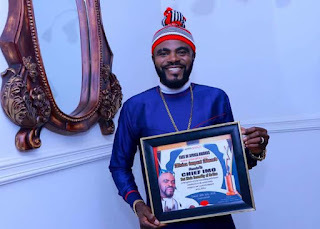 Dedicates most of the categories of Face of Arise Africa Awards to recognize media, Friend of Media and Democracy in Africa . He said; “Free and fair elections are indispensable in any democracy that seeks to be functional, credible and sustainable." "It is fair to say that for us in Nigeria and indeed all other viable democracies, national elections are the starting point of measuring the quality of the process for contestation for political power. The quality of elections therefore is crucial to the establishment of any credible representative government. Whenever elections has been proven or percieved to have been rigged as a result of being shoodily conducted or shabbily administered, the consequences have often been fatal. There are examples in Africa where disputed elections have been an icubator for violence. In some cases, they have led to civil wars and completely undermined a country's governance system. Imo state have not travelled along the path of violence. As a people we have continued to exercise maximum restraint ! Nigeria has also held successful General Elections with peaceful hand-overs or transfers of power. By all standards, this is no mean achievement at all. This feat has not been achieved without problems. There have been some serious challenges to overcome, revealing the faultiness of our electoral process. As a people, our triump has come from resorting to dialogue, debate and other forms of peaceful resolution of whatever situation we have been confronted with on our journey of building a viable democracy. Good practices need to be sustained. This edition of Arise Afrika Magazine seeks to advocate media for undisputed and peaceful 2019 election: need for the support of civil society. We express concern about reckless reportage by sections of media and intolerance of press freedom by sections of society both of which do not augur well for the cause of an undisputed and peaceful election. It is only through a concerted effort by media and civil society that we stand the best chance come 2019 polls. I urge my collegues in the media industey, journalist, bloggers to place decorum and circumspection at the center of your work throughout the electioneering period. We should place high premium on journalistuc code of ethics and other guidelines to help us ensure free and fair coverage of the 2019 polls. We reject the argument by some of our compatriots that our electoral challenges are teething problems and will pass with time. We cannot afford to live anylonger under the falsw and dangerous impression that we are peaceful and naturally insulated from danger of electoral violence. We should not allow ourselves to suffer such complacency. As a people, Imolites may have their peculiar characteristics but we are not any different from other human beings. We are humana and as such capable of doing both good and evil. We are seriously concerned over emerging acrimonlus trends, that is why we advocate that media be engaged for undisputed and peaceful elections. The support and corperation of the civil society is needed. A strong collaboration between the media and civil society to promote a rational and credible coverage of the election. This is imperative in the face of the impact of social media and citizen journalism on the information and communication landscape in a digital world. It is our hope that circumspection, decorum and respect for ethics and standards would guide both professionals and non-professionals engaged in information dissemination during the forthcoming election period to spare us misinformation in media coverage. We call on all arms of government, political parties, key governance institutions and indeed civil society an opportunity to reflect on their commitment to building democratic stability in Nigeria through their support for a free, fair, undisputed and free elections. On behalf of Arise Afrika, I wish to urge all members to collaborate to make the 2019 election a peaceful one. We owe this to our generation and those yet unborn. We salute all individuals, institutions and corporate organizations who have through their support for Arise Afrika contributed towards the development of the media industry. 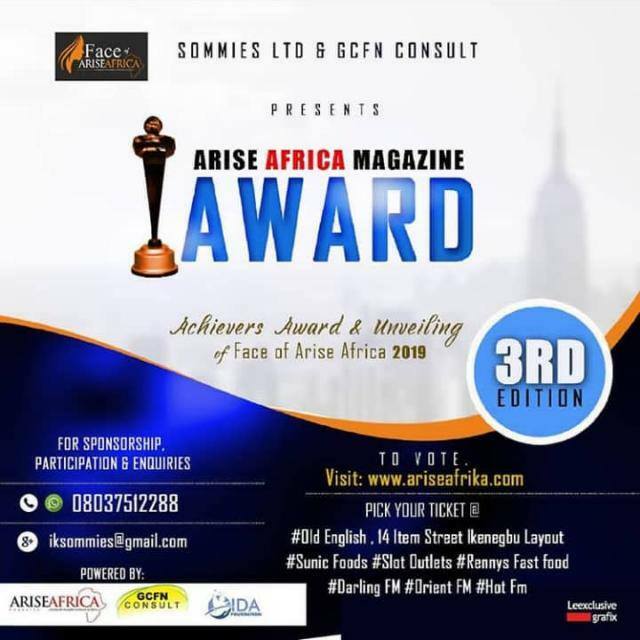 We wish to inform you that Arise Afrika Magazine Awards would hold this year. It is significant to note that the eastern heartland Imo is 42 this year. This region has historical ties with AAM Awards. The first ceremony held in 2016 at Imo Concorde Hotel. That maiden event, which was comparatively very small and modest was organized by GCFN Consult and Nigerian Eye Newspaper. I welcome you once again and wish to congratulate all Award winners for this year for distinguishing themselves and hope that their efforts will inspire others to even greater heights. Arise Afrika will help our people aquire the needed inspiration for the emancipatiom of African continent. Our laudable initiatives will birth-in some level of ethical and social implications for true modeling through our platform to equip and empower the youths. In conclusion, we as a people must continue to come together in designing a modern African state. A just pan-Africanist society where every blackman can stand proud. The Igbos have been ideologically consistent as a people centered political civilizatiom, for a thousand year: we will remain so. Nothing less can satisfy this dream of a society that is built on Trust, Justice and freedom. 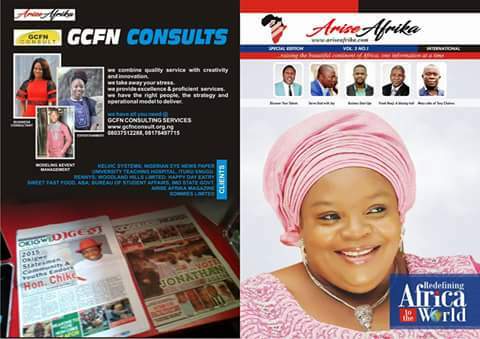 The Arise Afrika Magazine, Imo State Bloggers Association desires a free, fair, undisputed and peaceful 2019 election. We must unite to achieve this.